Stephen Dooley watched on from the sidelines as his new club, Coleraine, strengthened their grip at the top of the Danske Bank Premiership on Saturday. 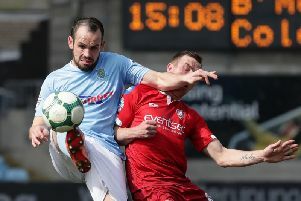 The forward, who won the League and Cup double with Cork City in the League of Ireland, was impressed with what he saw in the 1-0 win over Dungannon Swifts. Speaking afterwards he said he was counting down the days to begin his third spell with the Bannsiders.